Tributary of the Lower Jordan River in the Kidron Valley. The tributary flows all year round due to sewage runoff. Draped in beaming, white gowns, throngs of families gather impatiently on the banks of the Jordan River. They are waiting for a priest with a long, nappy beard to guide them beyond the shore and dunk their heads beneath the murky surface. They are Christian pilgrims who have traveled thousands of miles to be baptized in the same place as Jesus Christ was over a thousand years ago. However, their experience today is very different than it would have been in Jesus Christ’s era. The Jordan River is a very different river. About 96% of the Jordan’s original water flow has been diverted for human use and the little water that does remain is polluted with saline and untreated sewage. The pilgrims are bathing in filth. But Christians aren’t the only religious group who should be concerned. All three Abrahamic religions, including Islam and Judaism, have strong cultural and spiritual ties to the river, enunciated through both rituals and scripture. One vanguard nonprofit, EcoPeace Middle East, has decided to translate these faith ties to into action in hopes of rehabilitating the Jordan River to its biblical grandeur. 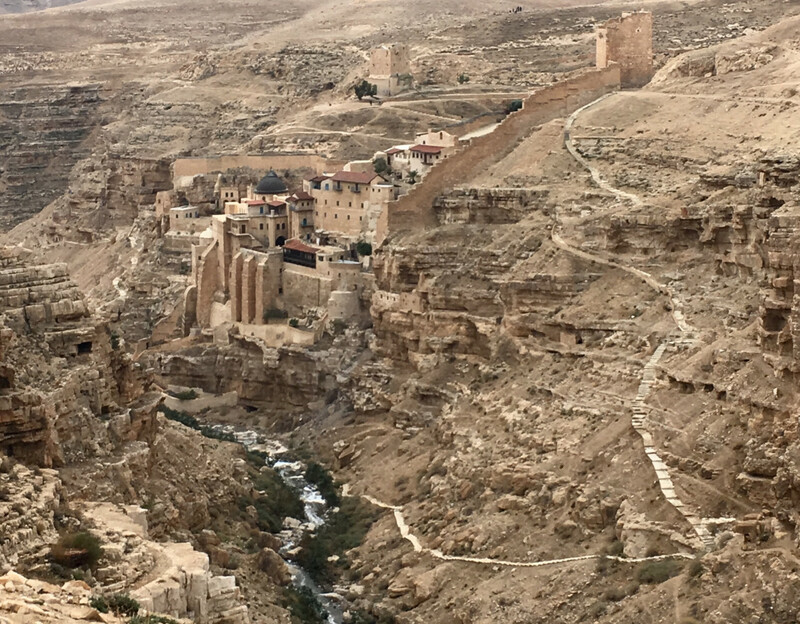 Through their ‘Faith-Based Action for the Lower Jordan River’ program, EcoPeace seeks to connect Christians, Jews and Muslims from Israel, Palestine and Jordan to clean up one of their main sources of freshwater and spiritual connection. And hopefully, cultivate peace among these peoples in the process. To cultivate this connection and communication, EcoPeace is working from the bottom up. The organization developed the Jordan River Covenant, a document endorsed by local religious leaders outlining a vision of a healthy river, and a collection of sourcebooks demonstrating each religion’s unique connection to the river. In addition, Eco Peace has led tours and directed events with religious leaders and congregations around the world to extend the scope of the conversation. “There are thousands of religious tourists each year and they expect to see this Jordan River ‘deep and wide.’ Instead, they see this tiny river of sludge and it’s just such a shock,” said Mira Edelstein, EcoPeace Tel Aviv Regional Jordan River Rehabilitation Project Coordinator. Because of the region’s arid climate and scarcity of freshwater, the Jordan River basin is and always has been a sacred resource for surrounding communities. People have sought to control it, command it and prevent others to access it. People have used it to define borders and split communities. People have used it as a divider. Conflicts over water rights in the region have persisted throughout history, re-emerging in the Arab-Israeli War of 1948, the Jordanian-Israeli peace deal, and the Syrian Civil War. Each country was looking to protect their water interests even if it was at the expense of another. It was a method of grab and take shrouded in policy. This legacy of conflict has left the Jordan River devastated. All bordering countries have engaged in large-scale water diversion projects to drain the upstream flow of the Jordan for personal or commercial use. The downstream tributaries of the Jordan are only kept alive today by a steady stream of untreated sewage emanating from Jerusalem. Like the Jordan River, religion is often thought to be a divider. It has been used to distinguish peoples from one another and even as a just cause of violence. However, religion has also forged supportive communities and been a vehicle for connecting these communities together. Religion can be a bridge for the Jordan River. In Judaism, the river is an embodiment of connection and a symbol of hope, as symbolized in the stories of Elijah the Prophet and the sons of Isaac. In Christianity, the river is the ultimate symbol of purity and its water is regarded as the most holy. In Islam, the river was a key battleground for Islamic expansion and a sacred burial site of close companions to the Prophet. For all, the river brings life. The solution for the Jordan River might not be as shiny and hi-tech as some hackers in Tel Aviv might imagine, but instead a return to traditions already in place. EcoPeace aims to bring the reality of the Jordan River to the forefront of community discussion and encourage action-based responses to help. According to Yaari, the campaign was very successful in the liberal strains of the three religions, whereas the conservative strains were much harder to tap into and would likely need a strong voice from within the community to promote action. But mainly, EcoPeace is just happy they got people talking. The overarching goal of EcoPeace’s program isn’t to clean up the Jordan River, but rather to create a collective culture of peoples who are willing to overcome their differences and work together for the common good. In a region so concerned with borders, EcoPeace is building a bridge.